Fifty-four experimental grassland ‘mesocosms’ were established outdoors between spring 2012 and autumn 2016 at the University of Exeter’s Penryn Campus. They consisted of 1 m tall wooden frames isolated from the surrounding environment by being lined with mesh and mounted on a trough. 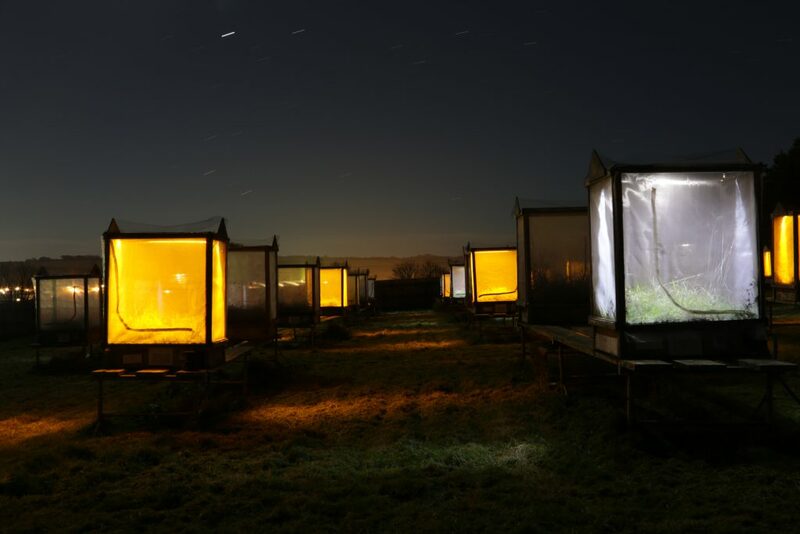 Within the mesocosms, enclosed communities of plants of 18 common grassland species, herbivores and predators were assembled and subjected to different lighting treatments and then monitored to determine how they responded. A diversity of possible responses were monitored, including the influences of the treatments on the timings of key ecological events, on the abundances of species and the composition and structure of communities. This experiment has led to multiple findings including that the impacts of artificial light at night can cascade through food webs, both from bottom-up (resource controlled) and top-down (predation controlled) impacts.